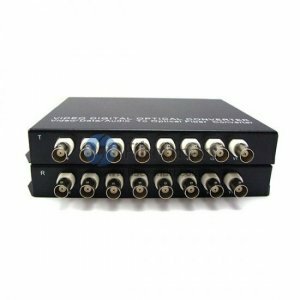 Fiber optic Video+Audio Multiplexer/Converter-Transmitter+Receiver combines digital video with digital audio to form the embedded signal. These Video+Audio Multiplexer/Converter operate as a transmitter/receiver pair for the transmission of one baseband NTSC or PAL video signal, with one channel of line-level, bi-directional audio, over a single multimode or single-mode fiber. We supply 2,4 ,8, 16 channels fiber video & Audio converters. The Plug and Play design ensures the ease of installation and operation. Please feel free to contact us for all your video to fiber and other video conversion requirements.